My son’s first birthday party has passed and it was fantastic. I must say, many things did not go as I had planned but, that did not stop the partying! From the moment I decided to have an outside party, I was checking the weather like a wild woman. When the date was just a week away, the weather looked promising. A beautiful sunny, 80 degree day with no rain in sight. The day before the party, I did a final check and the forecast took a dramatic turn to 68 degrees, cloudy, and RAIN! I can’t even express how upset that made me. Luckily, we had planned the party at grandma’s so we were able to move it from the backyard to inside the house. Since we had to transport just about everything; food, decorations, supplies, to the location, I was bound to forget something and of course I did. All in all, the party was wonderful and Miles had an amazing time. One of the things I forgot was my camera so the pictures below are a hodgepodge of iPhone pictures sent to me from my guests. Please excuse the quality. This is the dessert table. All of the desserts were homemade and took quite some time to put together. The two tiered structure that the cupcakes are on was also a homemade creation. 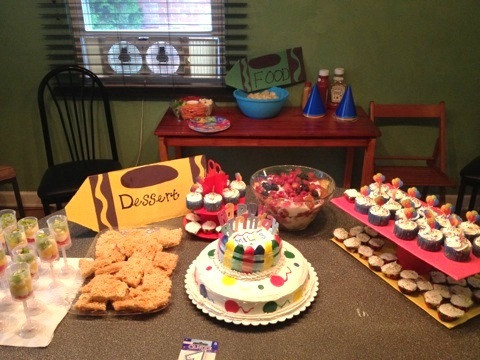 The crayons that say dessert and food were my favorite craft projects for this party. Here are the instructions on how to make them. 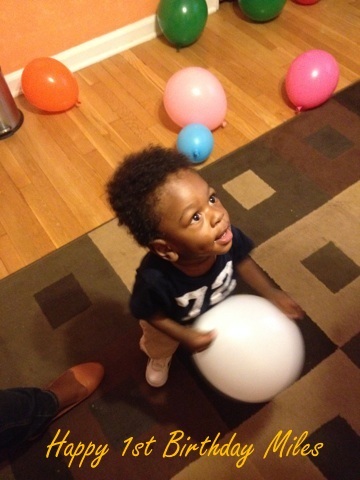 I didn’t plan any extravagant games or activities because my son is only 1. He doesn’t know how to play complex games so I figured edible finger paint would be perfect. The finger paint is a mix of vanilla yogurt and Koolaid packets. The colors turned out fantastic and the children loved it! This beautiful cake was made by Miles’ grandmother. I decided that the cake, the focal point of the party, could be whatever she wanted. Needless to say, she blew me away! When I was pregnant, she made my baby shower cake and it was absolutely gorgeous and tasted great. This cake did not disappoint. Here is my baby shower cake and cupcakes! If you love her creations as much as I do and would like her to whip up something special for your next gathering, email us at latifah.miles@gmail.com. After the activities, sufficient amount of dancing, and chowing down, we attempted to take a few family pictures followed by cake and presents. Thank you to everyone that joined us, not only for Miles’ special day but for the 365 days leading up to it. The support of our family and friends means more than words can express!